Google chairman Eric Schmidt is spending a lot of time on the road right now — he’s got a new book to promote — but he has popped into Google’s Motorola unit to see what the phone company is working up. It’s amazing stuff, he promises. And you’ll see it sooner rather than later. Ah. Great! So, is he talking about a new generation of phones, or some other stuff that isn’t a phone? “Think of it as phones-plus,” Schmidt said, stone-faced. Meanwhile, if you’re wondering when Google’s newest wonder product, its cool/creepy Glass glasses, will become mainstream, Schmidt says it has already happened — on the Google campus. It’s totally normal to see people wearing the all-seeing spectacles, all the time, he said. But what about people who have insisted they want no part of Glass, and have started preemptively banning it from their premises? 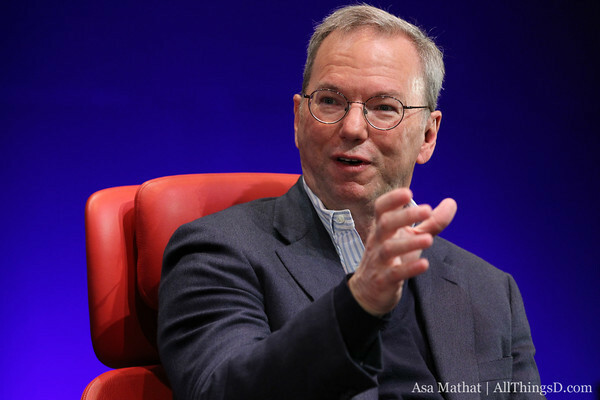 “I always love people who ban things they’ve never even seen,” Schmidt said.